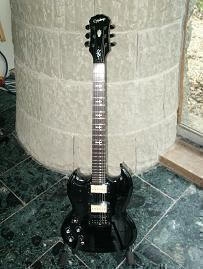 This is one of the stock Iommi signature models fitted with Gibson P94 pick-ups. These pick-ups are a version of the famous P90 single coil pick-up that will fit straight into a standard humbucker mounting. 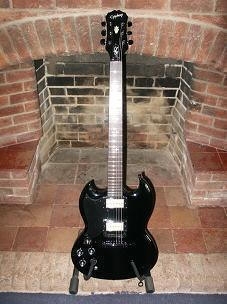 Hey Tony, I always thought you used humbuckers for your whole set! Does using the p90s make a huge difference in your sound? Are there any songs that you prefer playing with the p90 pickups? now, decades later i became involved in a little side-project…a sabbath tribute band “sabbath only sabbath” here in london ontario canada. 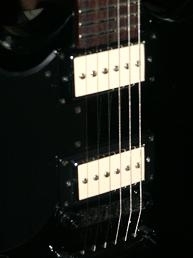 interestingly enough, i went totally against the grain so to speak with what many players feel they need to do to obtain a “heavy” sound, and equipped 2 of the 3 SG’s i use for the show with P94 pickups…right from day one. i use the one for the 440 tuned songs and the other for all the C# tuned stuff….I was so impressed with the results that even for my original Metal band “NAIL” I now only use p94’s in all my axes….No super high gain EMG 81’s or the like…the crunch and clarity from the single coils is just right for the lower tunings, and the bonus of the extra dynamics when you roll back the volume makes for far more expressive playing then you would get with a high-gain humbucker. I have never had any issues with single coil noise, but then again, the real tone of the amp isn’t really in the front end stage, but rather in the output/power amp stage. so, yes, you end up playing quite loud, but wow…If you want the real tone for anything off the first 4 albums, you can’t really nail it without going for a p90-single coil style pickup.